A new leak provides us with a closer look at the Samsung Galaxy S10e, the smallest and most affordable version of the flagship the South Koreans will launch later this month. The Galaxy S10e is Samsung’s very own iPhone XR rival, as it’s positioned as the base version of the Galaxy S10 product family and coming with features that are in line with those of Apple’s model. 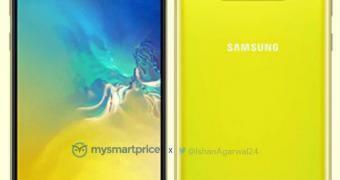 The photos you see here via MySmartPrice reveal the Galaxy S10e in a special yellow version called Canary Yellow. And while the main highlight is the color of the case, it also confirms a series of previous reports on this base S10 configuration. The most important is that the Galaxy S10e will use a 5.8-inch screen without any curved edges. While Samsung will use an Infinity O display as on the other Galaxy S10 versions, with a punch hole front-facing camera, this device will stick with a flat screen that could make it easier to hold in hand.